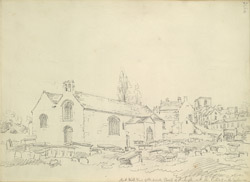 This drawing shows the parish Church of St Asaph from the south-west with the cathedral in the distance. St Asaph (Llanelwy) as an ecclesiastical centre dates back to the sixth century when St Kentigern founded a church and monastery here. When he died in 596, Asaph became abbot-bishop. Legend goes that St Kentigern asked Asaph, who was then only a young boy, to bring him hot coals to warm himself. The boy duly fetched them, but having nothing to carry them in used his cloak and suffered no burns to his flesh or clothes.